Online local services market, by now, have proved to be an enormous industry. Increasingly, customers are looking for service offering professionals in their own area to get their jobs done, be it plumbing, tutoring, gardening, physiotherapy, cleaning, electrical works, etc. The online service marketplace industry, witnessing a year on year growth, has been catching the attention of many aspiring entrepreneurs, who wish to launch online home service marketplace websites. The success of thumbtack is well known; So if you, as an aspiring entrepreneur, want to replicate the success of thumbtack in your country or state, then choosing a right template or clone software is important. 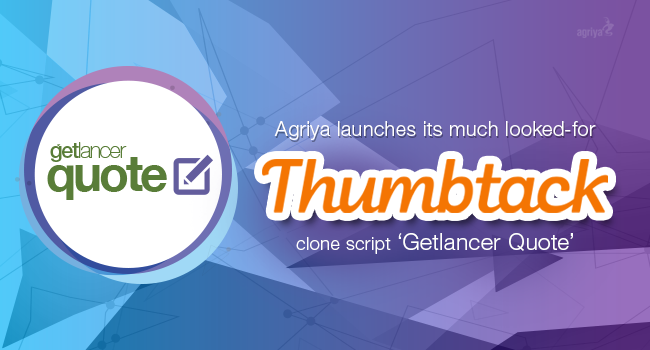 Agriya, which has been bench-marking the standards in the world of web development, has come up with Getlancer Quote, which is a Thumbtack clone script. The clone software helps entrepreneurs to create and launch a local online service marketplace website successfully. The clone software is unique, scalable and performance oriented, with lots of advantages incorporated into it. To make your website users comfortable in the process of hiring services and offering services, the working mechanism in Getlancer Quote is kept simple yet stunning. Customers or service seekers request for a particular service and then the service providing professional gives a quote, this is called a direct lead. On the other hand, in another method, known as the indirect lead, customers request a particular service to different professionals, who then quote the price. Out of the different professionals, who have given a quote, the customer chooses the one whom he considers fit for the job to be done. Service offering professionals can find in your created website, the best platform to sell their services. They can have their description in their profile, get reviews and rankings, post photos, video and audio to attract the customers. Doing this not only wins customers for them but also gives a sense of confidence to the service seeking customers. Top of all that is the best features embedded into this Thumbtack clone. A long list of cutting edge features also with great designs will be provided for entrepreneurs planning to startup an online local services marketplace platform. Additionally, entrepreneurs can seek customization of the software depending on their requirements. Revenues will see a constant growth, thanks to the cutting-edge features, apart from the numerous revenue generating options that become part of this software. Grab the opportunity as this the right time for entering into the world of online service marketplace industry.